Turkish President speaks with 17-year-old Ahed Tamimi hours after her release from an Israeli prison. 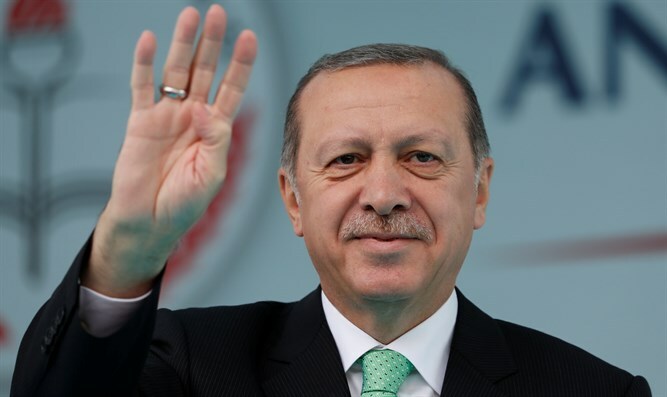 Turkish President Recep Tayyip Erdogan on Sunday congratulated Palestinian Arab teen Ahed Tamimi in a phone call hours after her release from an Israeli prison, the Turkish daily Hurriyet reported. Tamimi, 17, who was filmed slapping an Israeli soldier during a protest of leftists and Palestinian Arabs in her town of Nabi Saleh, was sentenced to eight months' imprisonment in practice and fined 5,000 shekels as part of a plea bargain. Erdogan lauded her “bravery and determination to fight”, according to Hurriyet. After her release, Tamimi went to Ramallah, where she met with Palestinian Authority (PA) chairman Mahmoud Abbas. The PA chairman said during the meeting that "the Palestinian young woman Ahed Tamimi is an example of the Palestinian struggle for freedom and independence and for the establishment of our independent Palestinian state."